The first pop superstar in American music history was neither a performer nor a recording artist – he was a songwriter. 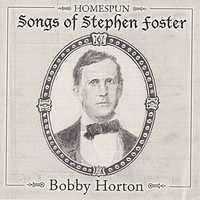 His name was Stephen Foster. He was the first American to make his living as a composer of pop music. On July 4, 1826 the country celebrated the 50th anniversary of The Declaration of Independence, Thomas Jefferson and John Adams died, and Stephen Foster was born in Lawrenceville, Pennsylvania. With little or no formal training, young Foster taught himself to play several musical instruments, and at fourteen years old his first composition was performed in public. At age twenty-one he wrote a song called "Oh Suzannah" and sold it to a publisher, W. C. Peters, for $100.00. By 1848 this song had become a hit from coast to coast. Mr. Peters made $10,000.00 from sales of sheet music and Stephen Foster had become a superstar. His most productive and successful years were the late 1840’s through the mid 1850’s, writing what he termed "plantation songs" for minstrel shows. Thought he wrote many of these songs in dialect, his lyrics depict the life of black people in The South with a sense of compassion and affection. These tunes were made popular by minstrel performers such as The Christy Minstrels. During this period he also began writing sentimental ballads as well as light-hearted songs. The year 1860 marked a decline in Mr. Foster’s professional and personal life. With high hopes he moved with his wife, Jane, and his daughter, Marion, to New York City to be near publishers with whom he had relationships. Though he continued writing songs (mostly war related and sentimental ballads) he could not sell them. His debts began to mount and Jane left him to return with Marion to Pennsylvania. Stephen grew despondent and began drinking heavily. In the winter of 1862 he was befriended by a young law student and lyricist named George Cooper. Together they wrote over twenty songs with limited success while George often acted as a caretaker. On the 10th of January, 1864, Mr. Foster had a serious fall, cutting his neck severely. George was able to get his friend to Bellevue Hospital where he initially showed some improvement, however, on January 13 he suddenly slumped down in his chair – America’s first professional songwriter was dead, but his great songs lived on! Since Mr. Foster’s music touched the common folk, it was my intention to arrange and perform these tines in the simple, straight-forward way 19th century string bands would have played them. Mr. Foster wrote songs about black people in The South with respect and compassion. For many in his day the term "darkey" was a term of endearment (it was used by Mr. Foster in this manner as well); however in the 21st century this word has negative connotations. In the spirit of Mr. Foster’s feelings on this matter, I have chosen to substitute the term "black folks" in its stead. Like all my other recordings, I created these arrangements, played the instruments, sang all the vocals, and recorded here in my home production studio (on TASCAM DA-88 digital recorders) – hence the "Homespun" in the title.